After 20 yrs of riding the Seven Axiom I decided to convert it to flat bars and a few simpler mods. Originally set up with with Shimano Ultegra 3x9, Cinellli drop bars, and Wheelsmith wheels. Now set up with a Easton EC90 XC carbon flat bar, Control Tech 1"x 25.4 x 150mm/5 degree stem, Shimano XTR M970 rear shifter, Shimano bl r550 flat bar brake levers, and Ergon GP3 grips. I retained the Ultegra brakes. Still using my Bebop pedals. I swapped out the 11-25 cassette for a 11-28, and replaced the 3 chainrings, 32/42/52 for a single 40T. The shifter works great with the original Ultegra rear derailleur, and no derailleur adjustment was needed for the 11-28 cassette. I'm still using the original Wheelsmith wheels, and will be replacing the 23 x 700 tires pair of Vittoria Rubino ProG 28mm tires. I converted my wife's Axiom to flat bars last year. It was a little more involved because she wanted to retain the Campy Record group set. 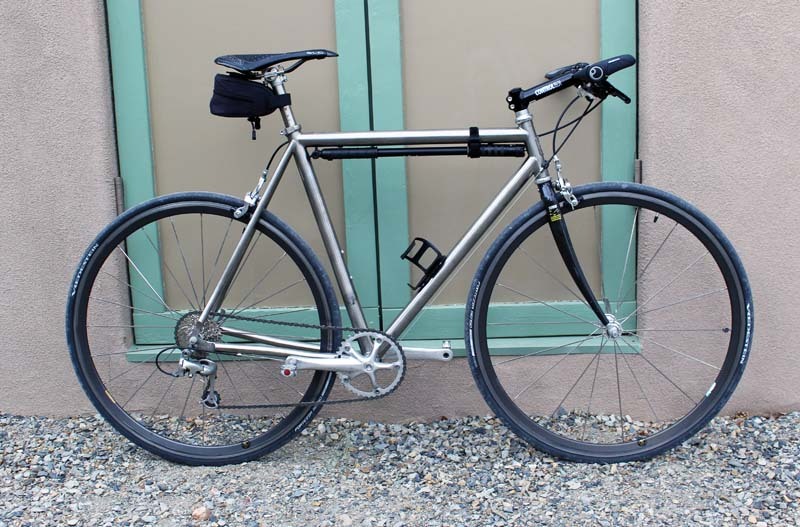 I went with the Campy Ergo flat bar shifter brake set up, a Seven titanium flat bar, and a Redshift suspension stem. We kept the 30/42/52 crankset and the 13-26 cassette. The wheels are zipp and the tires are the 28mm Vittoria Rubino. Fun stuff, and it keeps us riding. I saw on their website a couple days ago that Seven is celebrating their 20th year in business. You must have on the first few Sevens. That's pretty cool. Just out of curiosity did you know about Rob from Merlin or were you taking a chance on some new unknown company? We bought the bikes in Jan. 98. My wife had test ridden a Merlin. We went with Seven because at that time the frames were custom built vs off the self. "I swear to God the last time I checked I was twenty-seven and now I'm thirty-seven"